Alfred Angelo Sapphire Wedding Dresses, 2016. Floral Embroidered Lace Ball Gown with Sheer Yoke: Diaphanous net gown with a plunging neckline, sheer net yoke, and beaded trim embellished with crystal beads and rhinestones. 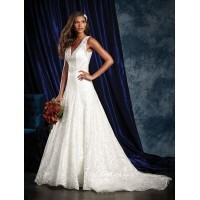 The entire gown has been adorned with floral embroidered lace. A dramatic sheer back yoke has been accented with matching lace along with the ball gown skirt and sheer chapel length train. Color: 602 Alfred Angelo Sapphire Wedding Dresses, 2016. Satin Fit and Flare Gown with Cu..